It's Pete, Ramon, and Cheezeburger hitting the Basement this week for a round of comic reviews at the roundtable! First on the hit parade is Order of the Forge #3, concluding a fun story arc the boys have been enjoying these passed few months. Joining the fellas live via The Pete Phone is Donn Berdahl, the mastermind behind Order of the Forge! Tony Wolf, writer and artist of the comic Greenpoint of View joins Pete and Ramon in the Basement and rehash tales of bygone Brooklyn. Also! The secret history of Midtown Comics is revealed! Deadpool is, well, dead. Alivepool is a thing. There's fifty-million comics in Convergence, Pete vows to review them all (not really). Miles Morales gets slipped a mickey in the clutches of Hydra! Will he escape?Also hashtag: HOOFDOOM. And we're giving away 10 signed Hellboy posters on Twitter and Instagram. Tune in to find out how to enter. WIN a Joker Batgirl Poster featuring the Art of Rafael Albuquerque!! Do you want to win a large 24x36 poster of The Joker and Batgirl?! Of course you do, or you wouldn't have clicked this page! Just use the Rafflecopter form below to put in your answer to the trivia question, and for much more ways to enter! Contest ends in a week, so hurry!! 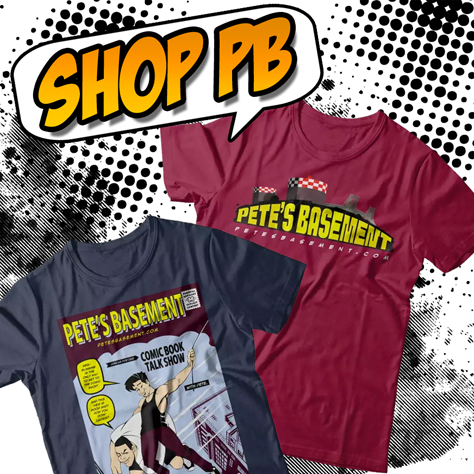 It's Old Home Week as Adam joins Pete, Steve, and Ramon for a classic Pete's Basement roundtable! The boys have a hard time coming to grips with The Hard Master, as well as any sort of plot from Age of Ultron!